Internal Program Quality Reviews and Audits are activities undertaken to measure the quality of the data in any course portfolio (done by Advisor for Academic Quality/ QAAC Director/ QAC Directors). The Portfolios review of the programs are conducted by the Quality Assurance and Accreditation Center at UOB. The Objectives of the portfolio review is to support each program to over-see the graduate performance, improve the teaching and learning processes at UOB and to assure that the requirements of the internal quality assurance processes at UOB are satisfied. The QAAC reviewers are not expert in the program curriculum, but they are quite familiar with the national and international assessment practices including summative, formative, direct and indirect assessment and feedback methods. 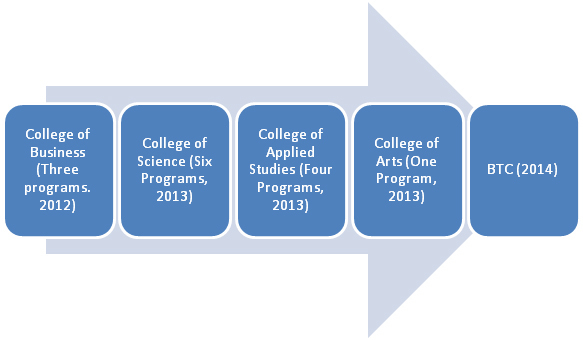 An important part of the portfolio review and follow-up process is to ascertain that any graduate from the Program satisfies the University Intended Learning Outcomes (UILO’s). The UILO’s are the minimum skills, knowledge and attribute any student at UOB must satisfy at the time of graduation. A judgment on whether or not the program satisfies these UILO’s can be drawn from the outcomes of the portfolios audit process. A written report provides an account of the QAAC review process and the findings of the reviewers based on the course portfolio contents as well as an interview of the program chair, the College Quality Assurance Office Director, faculty and students. Copies of the report are given to his Excellency the President of the University of Bahrain, the Dean of the College and the Department chair. It is expected that the chair of the Program will organize a meeting to discuss the outcomes with the Department faculty for further follow-up and improvement. If a meeting with the QAAC with the Department faculty is needed to discuss the review outcomes, then the QAAC’s Director should be informed to schedule such a meeting. 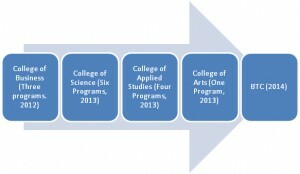 Action Plan is requested by the program, which is to be presented at the College and University Council. QAAC follows up the execution of the Action Plan.